Happy Monday friends! Kind of a low key weekend for us..and that was just fine with me! Kids and I spent most of Friday night organizing our office/playroom. It had been neglected as we enjoyed such a beautiful summer. It felt good to clean out and donate some old toys/games. The kids think it's a whole new room and were excited to find craft supplies they had forgotten about! I left for Dallas on Sunday afternoon for work conferences this week. I spent my Sunday morning packing. I am always proud of myself when I can plan it right and fit my clothes into a carryon! I am notorious for overpacking.. I have had to pay the overage charge for my checked bag more times than I care to admit.. so accomplishing this carry-on is huge for me! It's Meatless Monday! 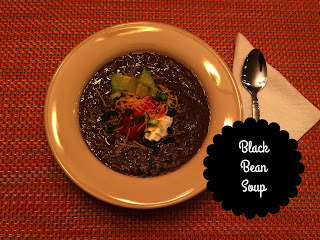 I have the perfect recipe for a cool fall day...Black Bean Soup! It's creamy and flavorful and a fan favorite in our house. We pair it with some fresh peppers or sometimes I'll make a simple cheese quesadilla to dip! Click on the pic below for the recipe. Thankful for my mom holding down the fort this week while I am gone. Paul is knee deep in a huge project and has had a crazy schedule. Wednesday we will be sharing lots of ideas for hosting a post Trick or Treating party! I hope you'll join us....there's always room for one more at our family table.